December was a busy month, but I did get all the work done that I'd planned to do on Villa del Vigneto. (I hadn't planned to do much!) When I started work on the villa two years ago, part of my vision was to have a grape arbor covering the loggia. That was one of the things that I did get done in December, and I felt as though I had reached a major milestone! I also adopted three cats and a dog to live in the villa, and I had fun giving them all names. (To Robert's embarrassment.) Robert, although very supportive of my miniature work, doesn't immerse himself in that world to the same extent that I do. He is not quite comfortable, for instance, if I begin to rattle off the names, occupations, and family history of the various occupants of my miniature houses whenever anyone expresses the least bit of interest. He definitely prefers a subtle generic reference - "cat" or "dog" - to my choices of names for Luca, Tosca, Rosabella, and Momi. I've promised Robert a glass of wine beneath the grape arbor if he'll learn the names of the villa's animal residents and address them accordingly. These construction components don't look like much, but then it doesn't take much to build a very old and rustic framework for grape vines to climb. I wanted the arbor located just outside the kitchen door and above the loggia. The basic framework has been glued together, then wired for extra support. The arbor framework shown from the southeast corner. I added supports across the top of the framework as well. 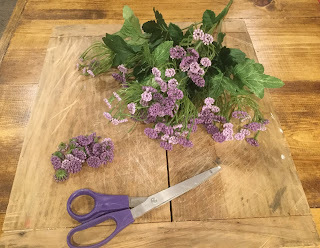 I found these twisted grape-vine looking pieces in my stash; I think I used the same thing for the wisteria vine that's growing at the French Farmhouse. I wove them among the supports that run across the top of the arbor frame. Now all I need are some leaves growing on the vines. A few months ago, I summoned all my courage and bought a kit to make some grape leaves. (I've never made plants from a kit, but I persuaded myself to try it once, just to see what would happen.) The kit had been packed away for a long time, and when I brought it out as I started work on the arbor, I was hit forcefully by a true fact: the kit would make fewer than one hundred grape leaves! Judging from the size of the arbor, I was going to need about a million more. So I searched Hobby Lobby's fake plant section and found a stem of an unknown leaf that sort of resembles a grape leaf. But - there were hundreds and hundreds of leaves on the stem. I separated the main stem of leaves into small sections and started painting. The paint provided a better color, but mostly it helped cover the shiny green plastic look of the leaves. I painted and painted and painted and painted. I painted both sides of every leaf, using a dark green paint for the base coat. Obviously, spray paint would have been ideal - except that it was 18 degrees outside, and I had no place to use spray paint inside. This is the finished pile of painted "grape" leaves, ready to be glued onto the vines. Using both Tacky Glue and hot glue, I secured all the leaves to the vines. Back to Hobby Lobby to buy grapes. Everything that I found was either too large or too tiny for a realistic grape; I finally decided that this was my best option, even though they're a little large. 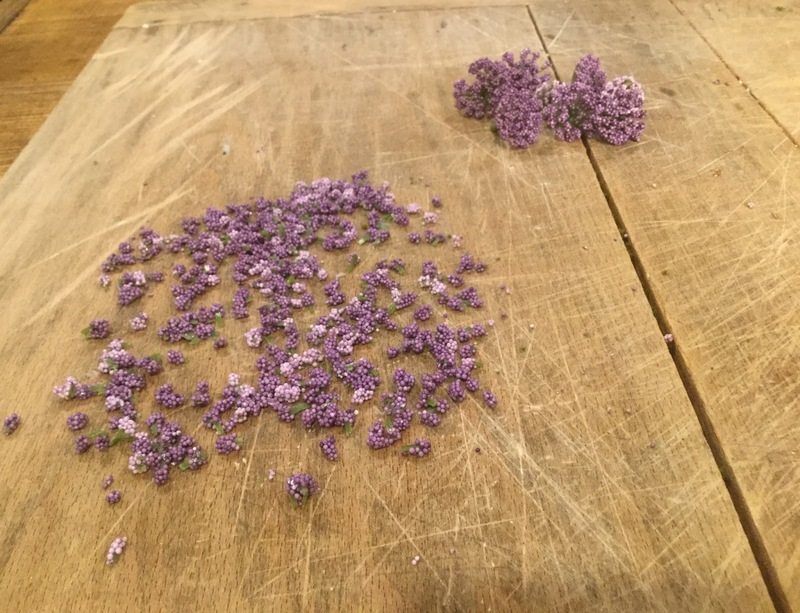 No, I did not try to make my own grapes. I needed about a million of those, too. ...and sorted those into miniature clusters, ready to paint. These are a few of the painted grape clusters, although some of them look a bit like blackberries! When I expressed concern about the size of the grapes, my granddaughter suggested that they could be globe grapes. That sounded like a good idea, until I researched globe grapes and found that they were developed in a California breeding program in the late 1950s. My current villa setting is probably very early twentieth century, about fifty years too early for realistic globe grapes. But we're all going to pretend that we don't know that, aren't we? One of my favorite new quotations says that "a little artistic freedom to get the right effect is not a bad thing." Thank you, Giac. Globe grapes they are! Above are some views of the completed grape arbor. I needed to relax after all that work, so I brought out some furnishings for the loggia and opened a bottle of wine. ("From the vine comes the grape, from the grape comes the wine.") I found two glasses in the kitchen cupboard and poured the wine, just in case a friend happens to come along to join me. Friends are always welcome here! I found purple flowers that could be separated into tiny segments for the flowers on the creeping thyme. And they needed no painting! The flowers are ready to transform moss into creeping thyme. Although I forgot to take a photo, I increased the thickness and height of the moss by adding bits of Light Green Coarse Foliage, a miniature landscaping material, to all the clusters of moss on the wall. After adding a bright green paint to the foliage, I glued on the tiny purple flowers - and now thyme is creeping all over the wall - the mossy transformation was a success! Tosca may prefer catmint, but she hasn't complained about the creeping thyme. A sunny wall is a sunny wall to a sun-loving cat! More creeping thyme all along the wall. You may notice that I've filled a copper grape pot with grapes from the vines. The pot hangs on a hook by its leather strap. This is a view of the loggia and grape arbor from the east end of the wall. And here is Villa del Vigneto in its present entirety. When I put the false back wall onto the villa to hide all the electrical wires, I had to design it so that it would pull away from the original structure easily. My design works well, but there are some gaps in the back corners of the villa walls, because the walls are rough and not quite plumb. I decided that the easiest way to remedy that was to grow vines up the end walls to cover the gaps. I needed a lot of vines - millions of vines - so I made another trip to YOU KNOW WHERE and found some viny-looking plastic plants that had leaves of pretty much the right size. History repeats. I separated, sorted, and painted, painted, painted. The vines are ready to glue onto the walls. I used Tacky Glue for longevity and hot glue along with it for instant hold. I randomly glued on some thin trunks for the vines; they can just be glimpsed here and there through the vine cover. You can see the gap in the corner wall that I'm trying to hide with the vines. The first branches of vines have been glued on. The vines are growing and reaching around to the back of the villa. A view of the west end of the villa with vines. Another view from the southwest corner. I've completed gluing more vines on the east end of the villa; these also reach around to the back wall. 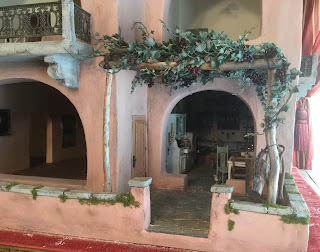 Here is a longer view of the east end of the villa, showing all the climbing, creeping, and clinging things that I've created for Villa del Vigneto. That brings to a close the work that I completed in December. The Old Year has also come to a close, ringing itself out in Nebraska with high style and low temperatures. Next up, to celebrate the top of a new year, I'll finally begin work on the top of the villa - laying all those hundreds (millions?) of clay roof tiles! I wish all of you a Happy, Healthy, and Prosperous New Year. Sí que has trabajado en diciembre!!! La elección de las plantas artificiales para hacer las vides,el tomillo y las enredaderas de las paredes ha sido grandiosa,son perfectas,la villa ha cobrado vida,me gusta,mucho,mucho,mucho!!!! le has sabido dar el tono adecuado y quitarles ese brillo del plástico,gran trabajo!!! Hello, Pilar - Thanks for your nice comments on Villa del Vigneto. I did a lot of leaf painting in December, and I hope there won't be any more to paint for a long time to come! I appreciate your visit. Hi, Sigrid - I'm so glad that you had a chance to stop by Villa del Vigneto. Thanks for the visit and for your nice comment! Hello, Rosa Maria - Thanks for checking out the latest progress on Villa del Vigneto. I'm so glad that you like the cats - you'll see more of them in future posts. Stop by again, and we can sample that wine! No matter which side you are looking at, the project scream Italy! It is beautiful. the arbor and the grapes are just amazing! The vines look terrific and the grapes do not look wrong at all... some fruit in Italy is so much bigger then what we have this side of the ocean. The moss fixer upper looks great. Every detail just adds tot he feel you were going for and everything is just right. What an amazing masterpiece Marjorie! I also approve of the names of the new pets. Non miniature folk never really get us completely, do they. I wish you all the best for 2018 and cannot wait to see more. Hello, Giac - It's quite a relief to learn that the grapes in Italy are indeed larger than their American counterparts - now I can stop pretending that the villa's grapes are globe grapes; I'll just admit that they're very superior grapes! I'm glad that you like the names of the villa's animals. Naming pets, whether they belong to the Real World or the Miniature World, is one of my favorite things, so I had a good time with those cats and the dog. (Generically speaking.) Thank you for your lovely comments. Hi, Lori - Thanks for your very nice comments, which are always much appreciated! You won't find Luca, the dog, or the pretty white cat, Rosabella, on this post - they were both elsewhere on other business and missed the photo op. But they'll make an appearance at a later date. Birds on the roof! A great idea that I'll try to incorporate. (When the villa has a roof, and if I can find Tuscan birds.) I remember trying to make pigeons to perch on the French Farmhouse dovecote ledge. Complete failure because of the feet. I was more successful in making the nesting pigeons for the interior, since their feet were tucked safely out of sight. Thanks for the suggestion! I LOVE IT! Your grape arbor is LUSH with foliage and the grapes are fat and juicy because they LOVE this site too! I also LOVE your solution for covering the gap. Having the green vine climbing the wall has softened the hard surface and made it look even more welcoming AND given the villa a sense of permanence with this additional connection to the earth. Hello, Elizabeth - I do like the way you give me credit for things that I never thought of - but it's very pleasant to know that you had those thoughts! 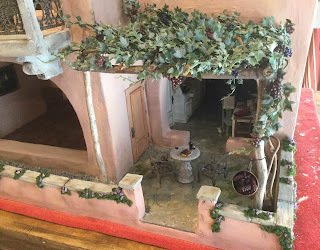 As, for instance, creating a sense of permanence and a connection to the earth by having the vines climbing the villa's wall. I had no such pretty notions - I only wanted to cover that gap! Thank you for viewing my creation in a far better light than I deserve. And thank you again for suggesting that I could turn the moss into creeping thyme - that was such a burden lifted! (And it was fun to do.) Now - starting tomorrow - comes even more fun (??) - those long-awaited roof tiles! Wish me luck. Hi Marjorie! Happy New Year! 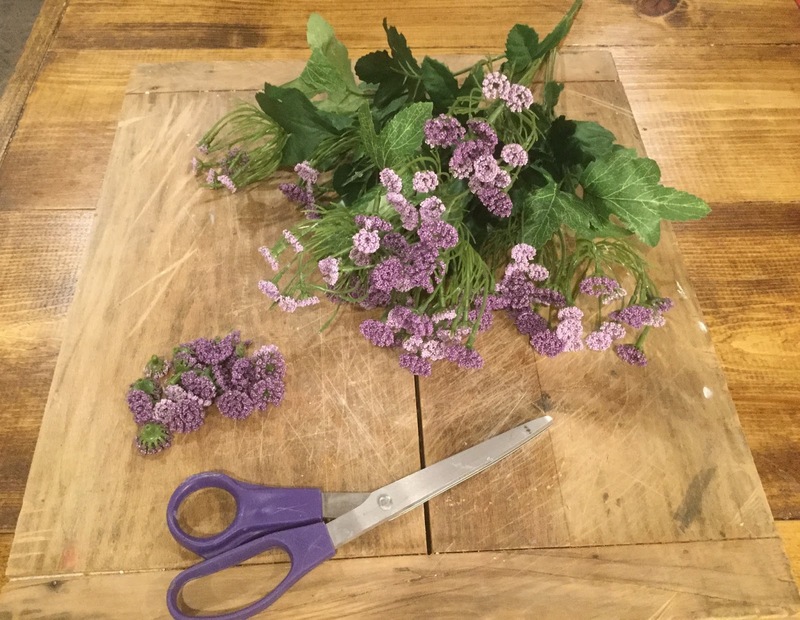 I have been "under the weather" so I have not caught up on blog reading and commenting.... let alone my own projects, alas! But seeing the pictures of your progress is very inspiring! The vines look Fantastic!!! 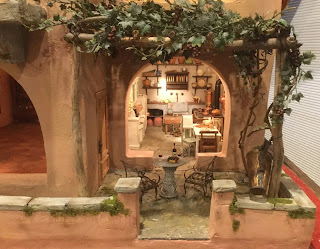 They really soften the walls of the Villa and provide that layer of make-believe that is just irresistible to miniaturists! Your kitchen grape vines look awesome and boy do I wish I was sitting there right now! (We are soooo cold!) The creeping thyme is a true success, I can almost smell the pungent aroma as I brush against the plants.... but I think the vines on the "extra" back wall are my favorite.... they add so much "romance" to this building.... on those back forgotten corners! Beautiful work all around! You have really succeeded with your climbing vines!!! Hi, Betsy - I'm sorry that you've not been feeling well; I hope there's been an improvement by now. I know that the very cold weather can't help; we've had some brutally cold weather too. I'm so glad that you like the vines on the villa's back wall. I hope to add more when I can face another leaf-painting session, since that false wall is such a big, bare expanse. Even though it will almost surely be placed against a wall and not be visible, I will know that the vines are there and be happier for it! Thank you for you complimentary comments - and you're very welcome to come sit under the grape arbor during your next cold snap. I'll join you! Happy New Year Marjorie - The pergola looks great. I also like what you have created with the grape vines & leaves. Your perseverance and patience paid off! The vines and flowers are a beautiful touch and turned out great. They add a sense of old-world charm and realism. Keep up the good work. Hi, Troy - Thanks for your very complimentary comments! I thoroughly enjoyed creating the grape arbor, vines, and the creeping thyme. (Except maybe for all the leaf painting!) But all those things do relieve some of the starkness of the villa walls - and there are some big walls! I appreciate your visiting the villa, Troy.